In 1988, Katha, an NGO dedicated to encouraging reading, was launched by Geeta Dharmarajan and began publishing stories in translation, eventually publishing from 21 Indian languages. Their effort reflected the work of over 600 writers and translators. This year Katha teamed up with Britannica to offer their translations electronically. Initiated by the editor Mini Krishnan and funded by a grant from the A.R. Educational Trust, Macmillan launched the Modern Indian Novels in Translation series. Krishnan also produced the Dalit writing in translation series that published Bama’s memoir Karukku. Besides Macmillan, other educational publishers, Oxford and Orient Longman, developed new initiatives. Oxford launched the Indian Drama in Translation series. In 2001, Krishnan herself moved over to Oxford, where she has continued with her dedicated mission. By next February she will have edited and published 95 books. These include recently departed Ananthamurthy’s Bharathipura. This space was joined by other publishers that launched Indian branches: Penguin, HarperCollins, later Random House and Hachette. Their focus was books in English, but they included titles in translation. Translations were also taken on by publishers of women’s writing such as Kali for Women (now Zubaan and Women Unlimited) and Stree. Today, nearly every publisher that brings out books in English includes some works in translation. Notable among them: Blaft Publications, from Chennai, which kicked off with Tamil pulp fiction; and Seagull, which offers the New Indian Playwrights series. There are many reasons offered for this small explosion in translation: the emergence of Dalit and feminist movements, increased interest in India’s linguistic diversity, the growth of the English readership. Indeed, the growth of literary translation into English was a parallel development with increasing numbers writing creatively in English. I believe that both reflect something in common: the maturity of creative writing in English from India. Earlier translations had been mostly done by people who had no ear for writing in English. The Indian English-language publishers also publish translations of titles from around the subcontinent, including Pakistan and Bangladesh. Translation initiatives are still weak elsewhere, though there are interesting new efforts, such as the Dhaka Translation Centre, which aims to partner with a small U.S. publisher. The number of quality translators has grown, with affirmation coming from several awards. Arunava Sinha, who has been translating from Bengali, has published 28 books over the last decade and won several prizes including the Crossword and Muse awards. Since the early ’90s, Lakshmi Holmström has published more than a dozen books of prose and poetry translated from Tamil. She won two Crossword prizes and other awards. Gita Krishnankutty translates from Malayalam and also won the Crossword and Katha awards. The number of translations being published depends, among other things, on good translations (no one can make a living yet as a literary translator), what’s available to be published, issues of rights, and assessments of what the market, still a limited one, can absorb. The three main publishers are bringing out under 50 new titles annually. From Oxford, Mini Krishnan writes, “I work with 12 Indian languages and do anything between six to ten volumes annually. Three months ago I added a 13th language… Dogri, from the Dogra region of Jammu and Kashmir.” She is especially excited by the unrepresented languages that she brings to publication. Reporting on their translation publishing from Indian languages, R. Sivapriya, managing editor at Penguin, writes that they published 22 titles in 2013, this year they will do 23 new titles, and they already have 22 original titles on schedule for 2015. How well do these books travel to the U.S.? Though some books are only distributed in the subcontinent, with a bit of effort, most can be ordered from the U.S. I use the site bookfinder.com, which searches through inventories at Amazon and small sellers or Indian booksellers selling through such vendors as Abebooks and Biblio. Readers rely on such outlets because direct distribution has many obstacles. Only a few publishers have distribution arrangements in the U.S. Seagull and Zubaan distribute through the University of Chicago Press. Many Indian books are now available as e-books. Titles from Penguin and HarperCollins are distributed through Amazon. Zubaan has an arrangement to publish e-books through Diversion Books, which are then available through Amazon and other sellers. Unfortunately there’s no way of telling what titles are available unless you search for one you’re looking for. There is no separate marketing for e-books. Though this would take an entire essay to cover, it’s worth noting that whether or not translations from India could find a larger U.S. readership may be affected by the choice of English. There are many translations that are fine for many readers in the subcontinent but may be difficult for an outside reader. So this isn’t just an issue outside the subcontinent but inside as well. Understandably Indian publishers will focus inside India. But something else is necessary to get the word out more widely. Perhaps the combined efforts of translators, publishers, academics, and other institutions can come together to create a central place that can showcase translations and works that should be translated. That is the hope with which I end this series. Final post coming: responses to some comments about this series raised here and in other forums. The best so far! Another aspect that could be explored is the psychological aspect of why someone from Kannada speaking background would be inclined to read a work translated from Sindhi or Pashto? 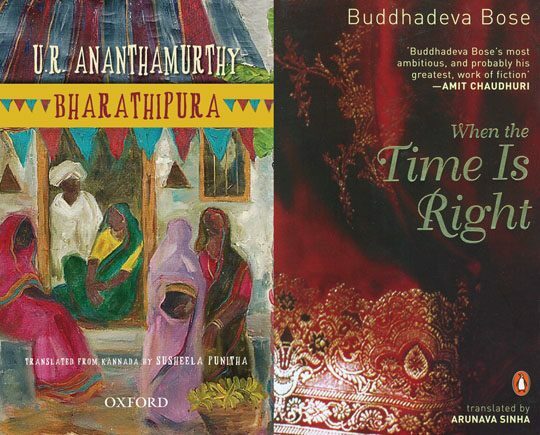 Also it would give us an interesting window into the South Asian mindset if you were to look at a comparative picture – within the South Asian context – of translations by non-South Asian authors vis a vis translations of South Asian writers. Do Murakami and Marquez not do well?